Other designations: Gagikashen; King Gagik's cathedral; Gagik Kilisesi; "Synod House". 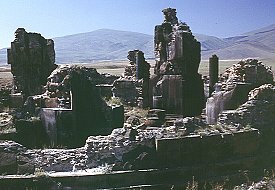 "It was at that time, at the end of the 1000th year of Our Lord's incarnation, at the time of the Emperor Basil, that Gagik, King of Armenia, was taken with the idea of building in the city of Ani a church similar in size and plan to the great church at Vagharshapat, dedicated to St. Gregory, which was then in ruins." 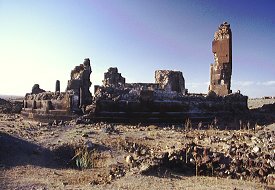 It is thought that King Gagik (who reigned from the year 990 to 1020) chose the architect Trdat (the man who designed the cathedral of Ani) to build his "millennium" church, and it was probably erected between the years 1001 and 1005 (some books say between 990 and 1000). 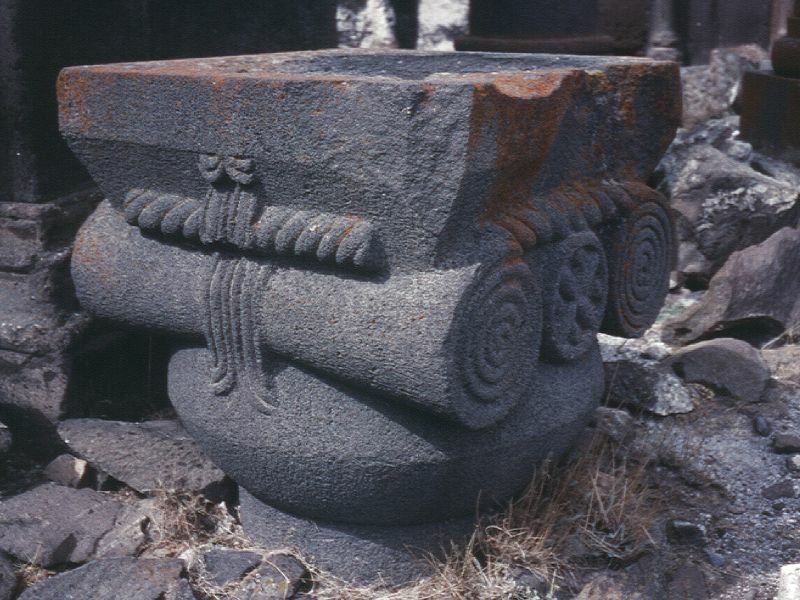 The church at Vagharshapat referred to above was the grandiose cathedral of Zvart'nots (the "Vigilant Angels") erected between the years 642 and 662, destroyed in the 10th century by an earthquake, and the most acclaimed architectural monument of early medieval Armenia. 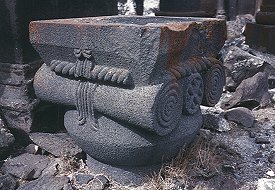 Zvart'nots was constructed at the supposed site of the meeting between King Trdat of Armenia and Saint Gregory the Illuminator as described by the Armenian historian Agathangelos in his account of the conversion of Armenia to Christianity during the 4th century. Tradition also says that it was built to house the remains of the saint. The patron and possible designer of Zvart'nots was the Armenian Catholicos Nerses III (known as "The Builder"). He was pro-Byzantine, and his cathedral united Byzantine and Armenian architectural forms - resulting in an strikingly elegant, complex, and boldly innovative design. Trdat's design for Gagik's church is of a circular ambulatory wrapped around an inscribed quatrefoil interior (four open apses contained within circular outer walls) that closely resembles the size and groundplan of the Zvart'nots original. The structure was never very stable, and in 1013 strengthening had to be carried out - including the addition of a substantial amount of extra masonry around the middle two columns of each apse, converting them into piers. These consolidations were unsuccessful and the church collapsed shortly afterwards. In the 13th century houses were built around and over the ruins, using some of the fallen church's masonry. Later the ruin site became covered with earth, and at the end of the 19th century all that was visible were some walls on a tall mound. 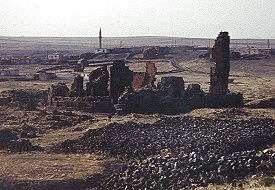 By this time, knowledge of the location of Gagik's church had become lost and the site was said to cover the remains of the "synod house" for the Armenian Church in Ani. 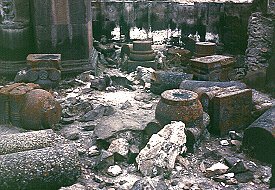 The ruins were excavated in 1906 by Nikoli Marr. 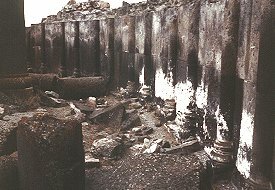 His excavations revealed the plan of the church and recovered many objects of worship, including a bronze candlestick and a chandelier. A detailed account of the excavation of this church is contained in Marr's 1934 book "Ani, a history of the city and its excavations". 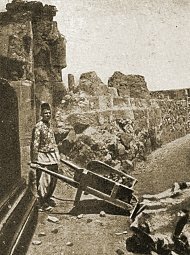 You can read a translation into English of the chapter dealing with the 1905 excavations here. 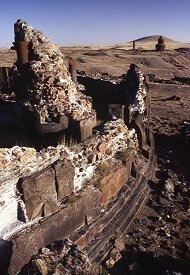 Since only foundations survive, the building's exact appearance is uncertain (like that of Zvart'nots, which was also excavated during the same decade). 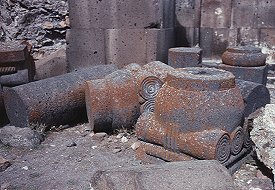 A statue of King Gagik holding a model of the church was found during the excavations, but the upper portion of the model was missing so the exact appearance of the church remains unknown. Follow the link for a page on this statue. 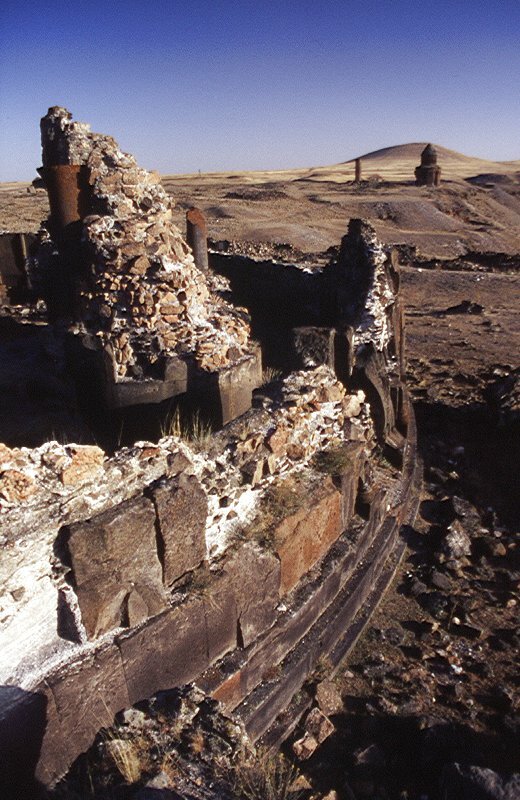 Both King Gagik’s church at Ani and the Zvart'nots church resembled tall, three-stepped rotundas. Their quatrefoil interior space rose up through three stories and was topped with a high dome on a drum. The dome in Gagik's church was said to have reproduced the appearance of the sky. The cut-away drawing below is a hypothetical reconstruction of Zvart'nots. Deciding on their elevations is more problematic because there is little surviving physical evidence. 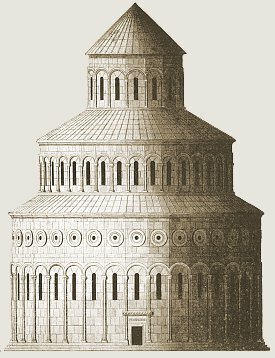 There have been a variety of hypothetical reconstructions - the main point of contention is whether the second level was circular or quatrefoil on the outside. 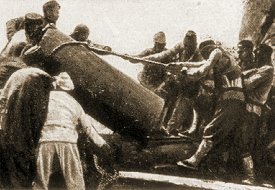 In architect Toros T'oramanian's reconstruction (of Zvart'nots) from the 1900s it is circular. This is the most visually attractive solution, but not the most structurally sound. In the reconstruction of Zvart'nots shown above it is quatrefoil. This page [Gagikashen Church] was first published in 1999. It was last modified on the 8th October 2000.